#AddressingTheSurface was a collaborative geovisualization project with recent OCAD University graduate, Graphic Designer and Fine Artist Jay Ginsherman, with ideas and direction from Ryerson University, Master of Spatial Analysis candidate Edgar Baculi. This project was inspired by the previous work of Ginsherman entitled ‘Liquid Shadows’ using translucent images or maps as well as a lighting device nicknamed the ‘Lightbox’. This piece along with Ginsherman’s previous and on-going work can be found here http://jginsherman.format.com/. 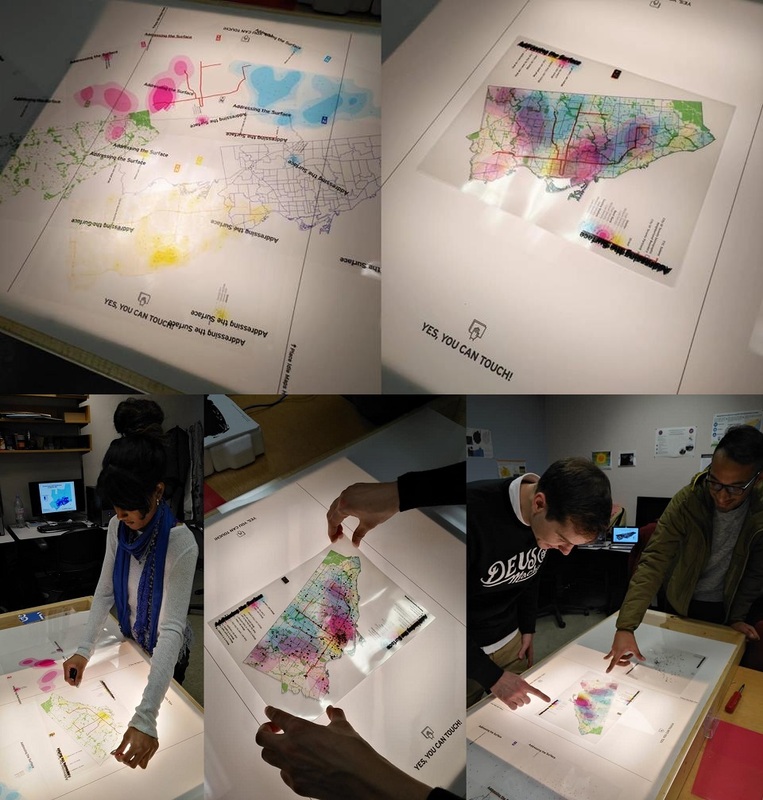 While attending OCAD University’s 102nd GradEx, Baculi encountered the work of Ginsherman and the GIS like experience of the attendees. From this the idea of using open data and actual GIS to produce a piece had begun. After consulting with Ginsherman a piece based on the lived experience of Baculi, open data and GIS was established. Having previous research work in open data, Baculi was familiar with exploring and downloading open data. The Toronto Open Data Catalogue provided all the data relevant to the project. The key focus of the data collection were datasets related to Toronto Community Housing and services of interest for these residents and other locations. 9. Three heat/ kernel density maps on services of interest for TCHC residents (based on Rent Bank Centres, Community Cooling Centres and Shelters. A key aspect of this project was the use of subtractive colours (Magenta, Yellow and Cyan) for the heat maps to show interesting overlap, resulting in new colours. The overlap of colours were designed intentionally to be open to interpretation to the map readers. Using ArcGIS the previously mentioned datasets were adjusted by Baculi with ideal symbology before being sent to Ginsherman. The discussions between Baculi and Ginsherman involved understanding how GIS works and cartographic ideals for the look of the maps, with great design to appeal to the audience. Baculi wanted to create a hands on GIS experience, with a legend that built itself up and remained legible to the map reader. Ginsherman incorporated these ideals into the final look under Baculi’s direction. Once Baculi completed the GIS portion of the layers, they were sent off to Ginsherman to improve design, layout and to print. Ginsherman used PDF’s of the layers in adobe illustrator, and ensured map alignment by limiting the work to the same illustrator file and giving each map its own layer. Printing involved using a laser printer, specifically at the OCAD University Digital Print Centre. Previous draft layers were also created to test the colour combinations and the best level of transparency for the maps. A key component of the piece was the Lightbox from Ginsherman’s previous work which was designed and built by Ginsherman and his father. The Lightbox is made of wood, acrylic glass, and LED lights which were screwed together. The Toronto boundary layer was the only layer not printed on a translucent sheet, but on the glass. The boundary along with the north arrow acted as guides to align the layering of the maps. The LED lights improved the clarity of the layering maps as well as directed attention to the piece. The end result was presented on Ryerson’s 2017 GIS Day and consisted of a Lightbox with the Toronto boundary printed on top and a total of 12 translucent maps. A variety of combinations were possible for interaction and discussion for the attendees. Please see the YouTube video below!